Join us for the biggest night of the year and experience a walk to remember. 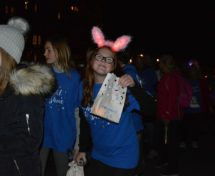 Shine for Pilgrims on our popular night-time 5 mile sponsored walk and raise vital funds for local hospice care. Thank you to each and every one of you who joined us at A Night to Shine this year. You've made a huge difference to the lives of people in our community who are living with a life limiting illness. A Night to Shine will take place in Ashford, Broadstairs and Canterbury on 20 September 2019. This year it's set to be bigger and brighter than ever! Get everyone together for a special night of fun, fitness and memory-making at our 5-mile sponsored walks in our local hospice communities. Entry includes T-shirt, medal and torch. 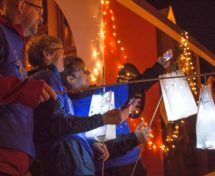 You’ll enjoy music, a friendly party atmosphere, an energetic warm-up and lots more, before setting off into the evening at 7pm amid a sea of shining torchlight. Whether you walk for fun, fitness or in memory of a loved one, come together with hundreds of hospice supporters and help us be there for the next family who need us. All of your favourite glowing merchandise will be available to help you shine even brighter! Remember, the best thing about memories is making them! Click below to view event listings for each venue and sign up today! 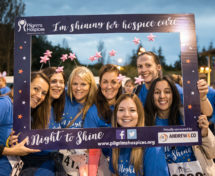 Join us for our biggest night of the year and shine for Pilgrims Hospices on a walk to remember in Ashford. Join us for our biggest night of the year and shine for Pilgrims Hospices on a walk to remember in Broadstairs. Join us for our biggest night of the year and shine for Pilgrims Hospices on a walk to remember in Canterbury.